Deputy Derek Geer, a Navy veteran and loving father of two, served 15 years with the Mesa County Sheriff’s Office. He was honored with the Lifesaving award in 2012 for helping revive a woman in cardiac arrest. After his death, Deputy Geer continued to save lives donating his organs to four different people. In December of 2016, he was awarded the Medal of Honor posthumously. Deputy Geer is the only person to ever receive the Medal of Honor in the history of the Mesa County Sheriff’s Office. The Mesa County Sheriff’s Office along with many community members paused for a moment of silence on Feb. 8 at 11:15 a.m. to honor Deputy Derek Geer’s service and sacrifice. The Grand Junction Regional Communication Center aired a Code 1 Air Memorial on all law enforcement radio channels in Mesa County. Code 1 Air is a radio call used to clear all radio traffic for a critical incident. 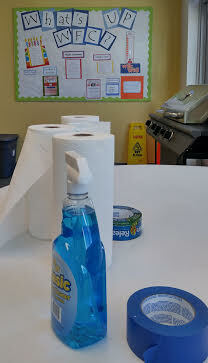 New Emerson School shows their support. Local law enforcement, first responders, and family gathered to pay their respects to Deputy Derek Geer. 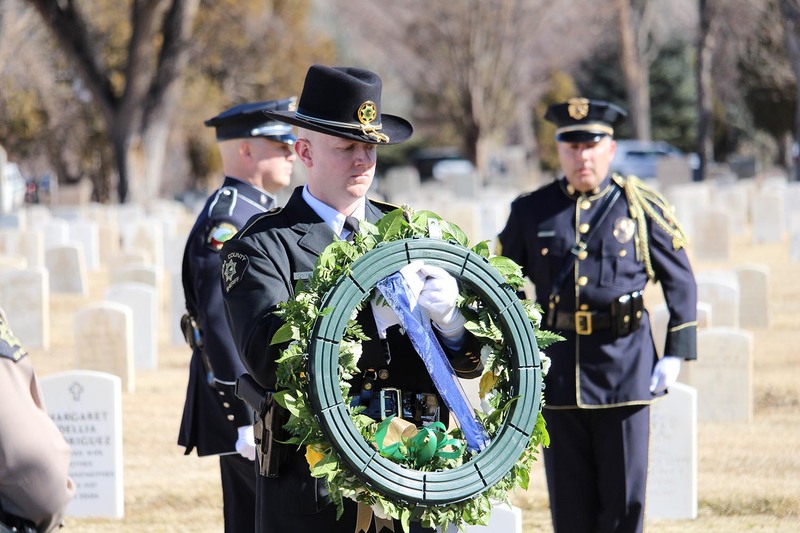 The combined Honor Guard of the Mesa County Sheriff's Office and the Grand Junction Police Department lay a wreath down on Deputy Geer's grave in a solemn ceremony to honor his service and sacrifice to the community. 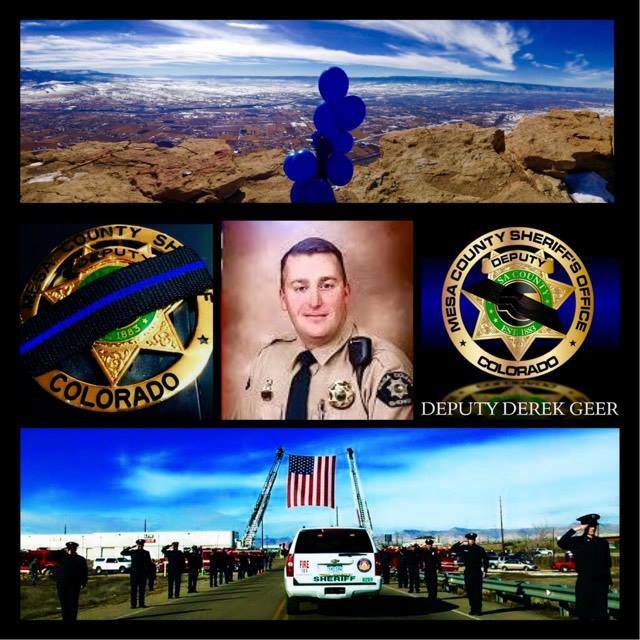 A moment of silence in remembrance of Deputy Derek Geer. 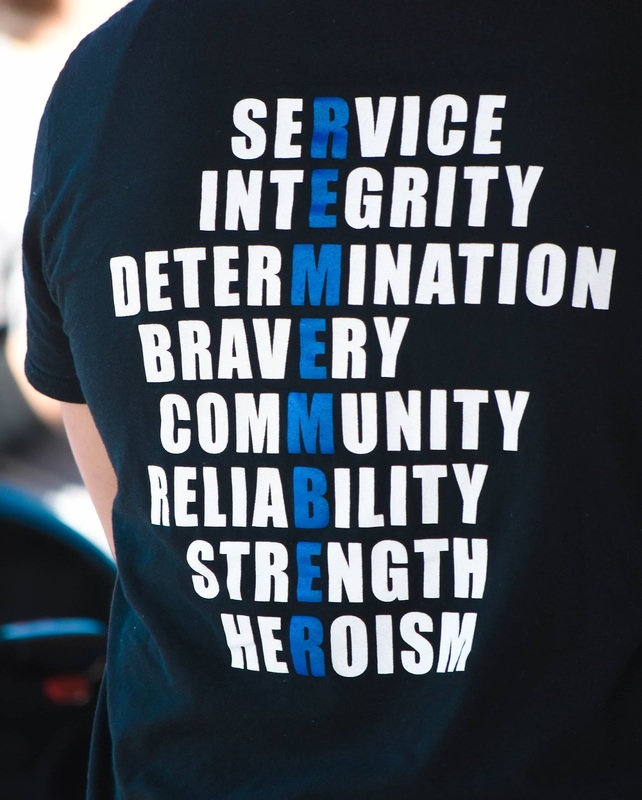 A Code 1 Air memorial was broadcast at 11:15 a.m. on Wednesday over police scanner radios throughout Mesa County that lead a moment of silence in honor of Deputy Geer. 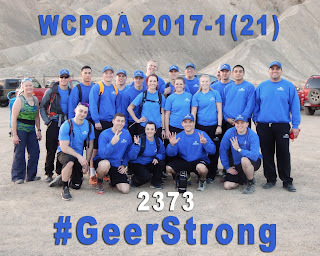 "Deputy Geer gave his life while serving his community with courage and valor." The Honor Guard salutes a true local hero. 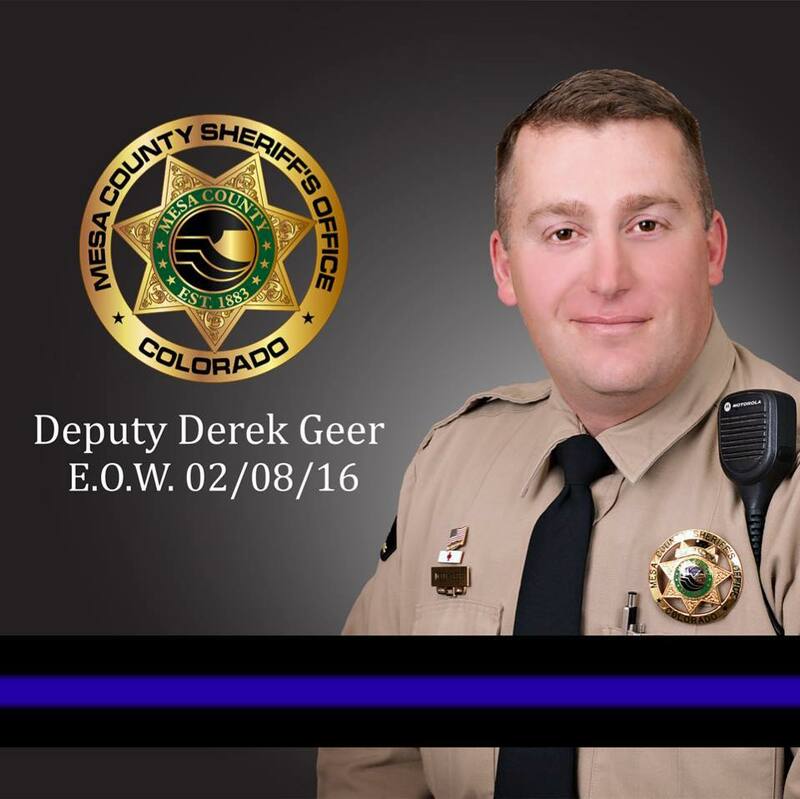 The combined Honor Guard of the Mesa County Sheriff's Office and the Grand Junction Police Department pay tribute to Deputy Derek Geer. Community members attend a memorial service in honor of Deputy Derek Geer Wednesday morning at Long Family Memorial Park. 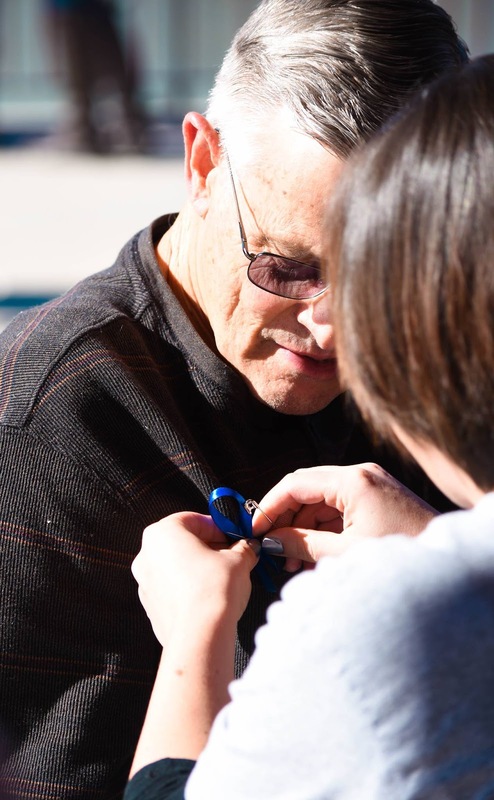 Community members wear blue ribbons in remembrance of Deputy Geer. 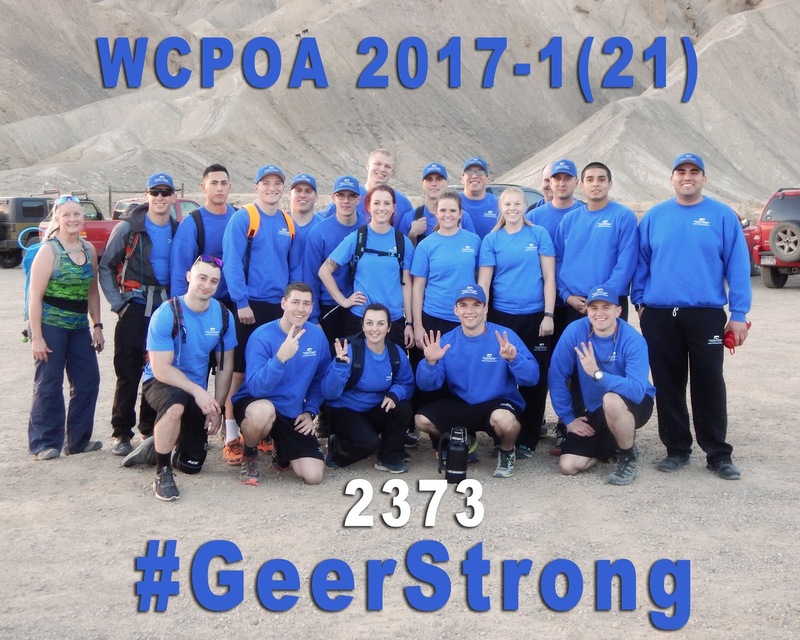 The Western Colorado Peace Officers Academy wear blue to show their support. The DHS Welfare After Hours Team provides a delicious breakfast for the Sheriff's Office in remembrance and honor of Deputy Geer. The Department of Human Services along with Workforce Center staff wear blue in support of law enforcement on Wednesday. 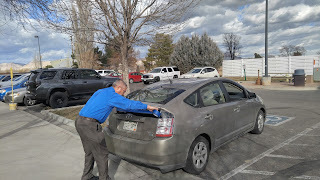 DHS/WFC Fun Bunch supplied all the items on Wednesday for staff to reapply the thin blue lines on their cars in support of Deputy Geer and law enforcement. Mesa County Department of Human Services Executive Director Tracey Garchar applies a new blue line. 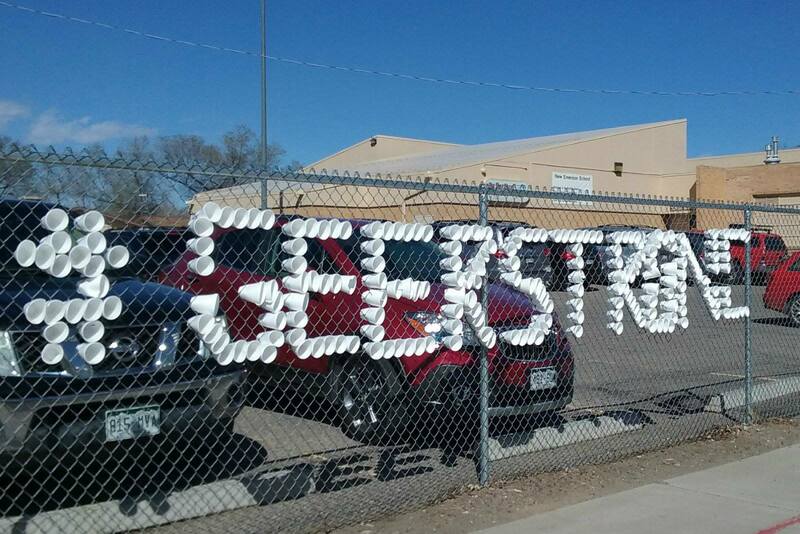 Community members show their support for the Mesa County Sheriff’s Office and Deputy Geer’s family. 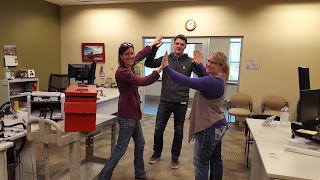 Strive members stop by the Mesa County Sheriff's Office to honor Deputy Geer. 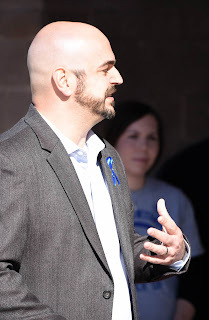 Strive, formerly known as Mesa Developmental Services, is a partnership of people supporting people. 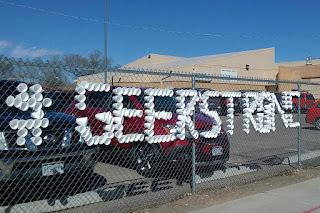 Fruitvale Elementary School honors Deputy Derek Geer. Pomona Elementary School adds a blue line to their fence in remembrance of Deputy Geer. 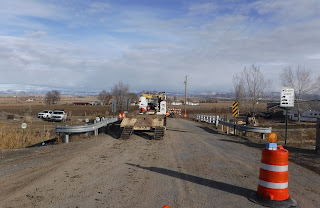 Mesa County Bridges MM-16-N.3 and MM-16-O.5 are located on 16 Road northwest of Fruita and are currently load limited. The two structures are separated by 1.2 miles and cross the Grand Valley Canal. 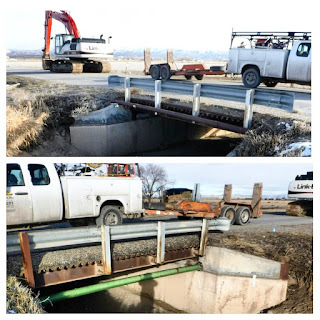 The structures will be replaced and designed to transport current legal limit loads. 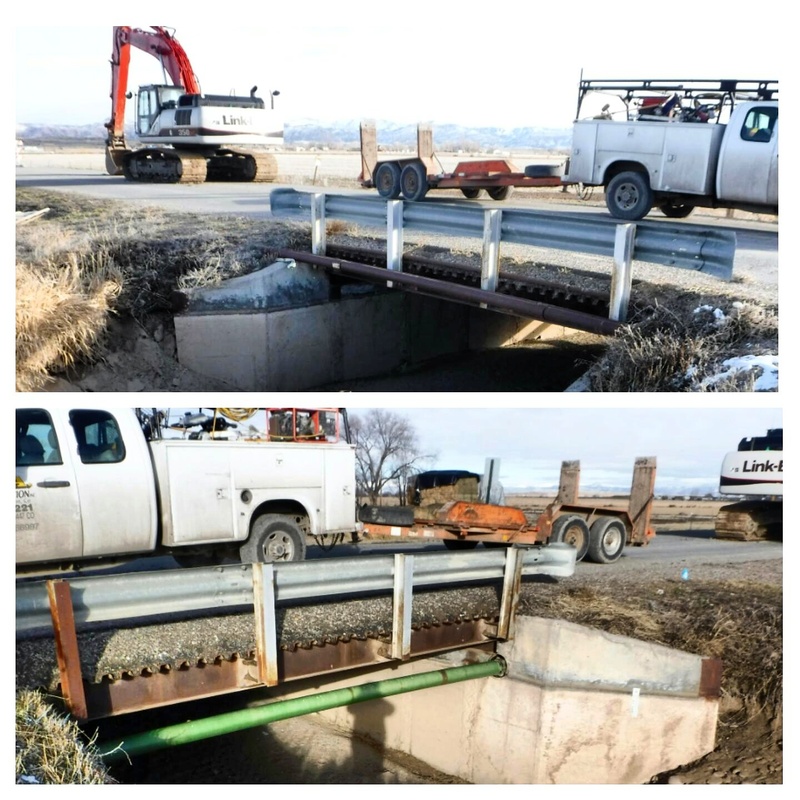 Additionally, the structures will be widened to allow for future 16 Road corridor enhancements and growth. 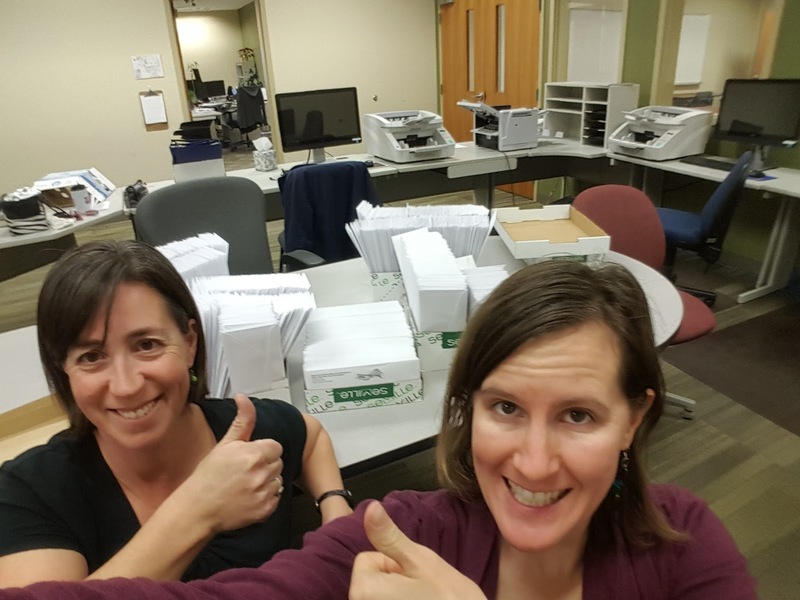 The project is partially funded by a DOLA grant. The project on 16 Road that will replace the MM-16-N.3 and MM-16-O.5 bridges is scheduled for completion by the end of May. Mesa County Health Department Regional Epidemiologist Andy Tyler spoke with R-5 students about careers in Public Health on Thursday. Multiple MCHD staff members from the Health Promotion Team and Nurse-Family Partnership presented to the class. From left to right, Melissa Neubaum and Teresa Nees both with Noxious Weed & Pest Management assemble the ballot mailing to send to eligible property owners in the Upper Grand Valley Pest Control District. Teresa Nees, Amanda Polson and Jesse Redmond with Elections share a group high five for the successful collaboration during the preparation of the Upper Grand Valley Pest Control District election.